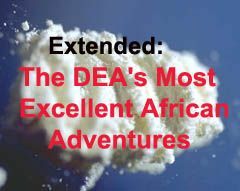 The New York Times reports the Drug Enforcement Administration will be expanding operations in West Africa, in continued efforts to stop cocaine from going from South America to Africa to Europe. In 2009, the U.S. drug war budget for Africa was $7.5 million. For 2010 and 2011, it was $50 million. Now, for 2013, it seems to be at least $60 million.